The open road, and it’s accompanying freedom, can sometimes allow me lose myself in solitude. I find myself, all too frequently, lost in time. A strange feeling indeed, to be surrounded by people, cars, places, yet to feel totally alone… forsaken to my path. This is however, one of the reasons I love the road so much though. I am basically an introvert by nature, far from the social creature people suspect of me. I am more the lone soul, trudging a path through darkness, forever drawn to the setting sun or harvest moon. I drive through the heartland of America, with it’s field of corn growing tall and proud all around me. What goes on in my mind though, is thoughts of times past when these fields were naught but grassland or forest. yet to be tilled or turned by human hands… oh what beauty there must have been. If I choose to pause, I do so in a place where there is no false electric light, or modern conveniences so as to allow myself to hear the spirits of old. I long to find their story, listen to their dreams, wonder if those grand dreams were ever realized. 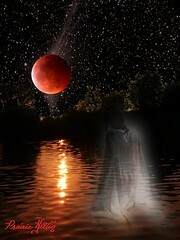 I enjoy listening, endeavoring to hear the spirits speak, learning their desires, loves, wishes. My favorite places are those with trees; old, time tested and weary. Places the wind can whisper in the leaves and branches, waking the dreaming ghosts. Phantoms of an era long passed, yet still quite alive and vibrant in it’s apparition’s. Each place I visit seems to have it’s own specter’s, residents long lived yet far from alive. Each has it’s own tale, trials, tests…time alone tells of the difference. To gaze upon the stars, wondering, seeking, feeling those unknown, welcoming them. They are out there, sharing the world around us. What they must think of that which has become of their efforts. To hear them, ask if they are proud or disappointed. No I am not crazy, somewhat spiritual yes, but not in the sense most think of. I am working on a project, a novel perhaps, I’m not really sure what it will become. It has taken much of my thought and time. The characters are introducing themselves, allowing me to write their story. It is a process, and a slow one at that for I want to get it correct. When the time is right, I will share what I have been working on.